HENRICO, Va. (WRIC) — You could say Brian Korte’s job is child’s play. “I’m an artist who uses Lego as an art medium,” Korte explains. Brick by brick, the Chesterfield man creates colorful and vibrant mosaic portraits out of little, plastic Legos. This former IT professional turned his side hustle into a full-time job a couple of years ago. His company, Brickworkz, has designed artwork for people and corporations all over the world. Now, Korte is putting his creativity on display here at home. His exhibit: Vibrance debuts Thursday night at the Cultural Arts Center at Glen Allen. 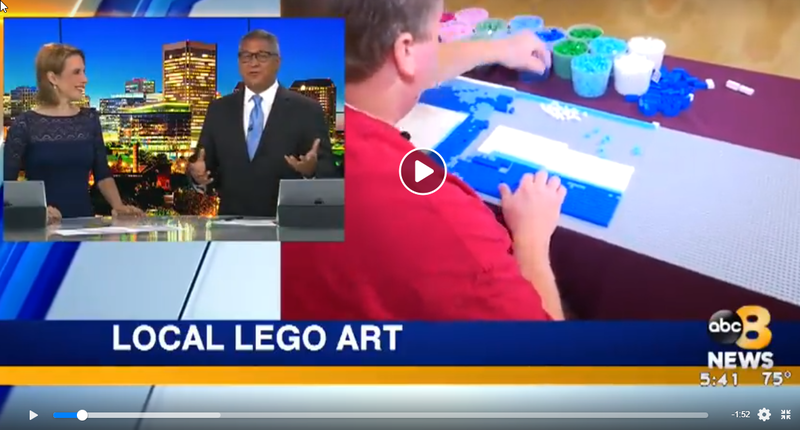 “It is really amazing for me to be able to take a step back and see it hanging on a wall,” adds Korte, who says he’s invested more than 200 hours of Lego labor in the masterpieces. An entire memorial is filled with tributes to people who have passed away. “It can kind of keep a memory alive in a fun way,” Korte explained. He also pays homage to iconic pop culture. A new lenticular artwork looks like Star Wars’ character Han Solo when standing to its left but when you walk to its right, Chewbacca appears. “This is imagination on the walls. It’s kind of fun and colorful and that’s kind of the point of the show. It’s to be vibrant and colorful,” says Korte. Vibrance: Lego Art by Brickworkz will be on display through July.